The International Federation of Medical Students' Associations (IFMSA) is a non governmental organization representing associations of medical students. It was funded in 1951, and currently maintains 102 National Member Organizations from 95 countries across six continents. The main activities of IFMSA are student exchanges and different projects. Around 10’000 medical students each year participate in international medical student exchanges, both professional and academic (research). IFMSA organizes projects, programs, seminars and workshops on areas of public health, medical education, reproductive health and human rights and peace. 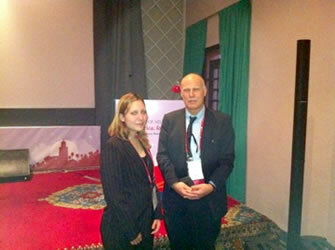 In 2011 the World Federation of Neurology signed a Memorandum of Understanding with the IFMSA. The purpose of this Memorandum was to define areas of possible collaboration between both organizations. Up to two students might be invited to attend the World Congress of Neurology. The impressions and experience of their attendance will be published in a report on the WFN website. The WFN offers potential support to the IFMSA Professional Exchange by intermittent review and approval of the Neurologic checklist, as basic requirements for a one-month clerkship in a department of neurology.